December 7 - "A day that will live in infamy"
Below is an audio clip of President Roosevelt's "Infamy" speech, made before Congress on December 8, 1941. I hope you will find it useful in integrating history and meeting the Common Core Standards for Speaking and Listening. Of course, you might consider reading the transcript of the speech with your students as you pursue the Common Core Standards for Reading Informational Text. 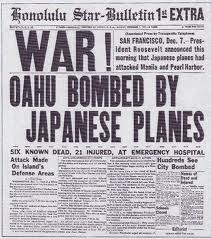 Yesterday, December 7, 1941 "a date which will live in infamy" the United States of America was suddenly and deliberately attacked by naval and air forces of the Empire of Japan. With confidence in our armed forcesâ€”with the unbounding determination of our peopleâ€”we will gain the inevitable triumph- so help us God. Transcription courtesy of the Franklin D. Roosevelt Presidential Library and Museum.